This recipe for traditional Irish scones was passed down from my mother. 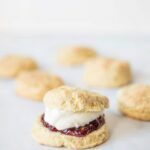 Served for breakfast or afternoon tea and accompanied with jam and clotted cream or simply with butter, these authentic scones are simple to make but absolutely delicious! Growing up in Ireland, scones were a staple. Stuck at the train station and feeling peckish? Grab a scone and some jam. Popping over to a friends’s for a quick cup of tea and chat? She’ll have some fresh buttery scones to serve, no doubt. Not only are scones a traditional Irish recipe but they are also one of the first recipes that Irish kids learn to bake. And such is the case for me. This recipe is the same one my mother uses and it produces lovely buttery (but not too crumbly) scones. My personal preference is to eat them warm with some butter and raspberry jam but if I’m feeling fancy (or a bit naughty) I’ll switch out the butter for whipped cream – or fancier yet, clotted cream. You don’t need a fancy cutter or anything. My mom uses a glass dusted in flour to cut hers out and so do I! Looking For More Traditional Irish Recipes? The great thing about Irish quick breads like these scones as well as Irish Soda Bread, is that you just make it and bake it. There’s no yeast or rising to worry about. The baking soda is the only ingredient used to make them rise, so once they the ingredients get wet and get the heat from the oven, they will start to rise. You don’t need to worry about working with really cold ingredients either. Both room temperature and cold butter work equally well. Finally, feel free to adapt these scones to your taste. In Ireland, we regularly substitute the white flour for whole wheat for a healthier option. You can also omit the sugar and for a savory option – add in about a quarter cup of sharp cheddar or even a variety of mixed herbs! If you’ve never tried Irish scones you should give these a shot! If you’ve never had them before, they are similar to American biscuits but sweeter (generally) and not as flaky. Oh, and traditionally they should be round and not triangular like American scones. Preheat oven to 425°F. Sieve flour, baking powder and salt into a large bowl. Stir in sugar. With your hands, rub the butter into the flour until it resembled course breadcrumbs. With a whisk or fork, mix the egg into the buttermilk. Create a well in the middle. Slowly add the buttermilk until you have a soft dough. It should just come together and you should be able to handle it without it being really sticky. Place the dough on a floured surface and knead a couple of times just to remove any cracks. If the dough is too sticky, add more flour. Roll out to around 1 inch thick and cut with a cutter or glass dipped in flour. Place on a floured/buttered baking sheet (or use parchment paper). You should get about 12 scones. Brush each scone with milk to help brown the tops when baked. Bake for 10 - 15 minutes or until the scones are golden. Best served immediately but can be warmed the following day or eaten cold. Did you make these Traditional Irish Scones? I’d love to hear your thoughts. Drop me a comment directly below! Yay I’m glad they worked out! I made these yesterday and they were wonderful. Thank you for sharing this recipe! I will be making them again and again! Yum! I just made these for an afternoon tea on St. Patrick’s day, they are so delicious! Yay! I’m so glad you enjoyed them – I love them, too! At what point do you put the baking powder in?? Hi Jacqueline, the baking powder should be combined with the flour. Hi Jenna! I want to try these because I am a failure at making biscuits! When do you add the egg?